The focus of this 4.0 release appears to be more on creating a balance – providing IT groups better tools to manage the structured data which is moving to real-time, in-memory and mobile models; and managing unstructured data (e.g., social analytics – what and where are customers saying about the different products; what promotions will influence social buying). The challenge for IT is that both structured and unstructured data are growing exponentially in every company. It is not out of the ordinary now that leading companies may be generating and analyzing using a complex event processing a petabyte of new customer, sales and production data, operational data from real-time telemetry, RFID enabled supply chain processes per day. A few years ago this type of “big data” scenario was unthinkable. Do I simply move some of the data into the private cloud (e.g., Appliances) or use a SaaS provider (cloudsourcing)? The answer is probably going to depend on business users with the budgets and who long they are willing to wait for new decision support and analytical functionality. Let’s not forget the pressure from users for better and simpler visualization and User Experiences (UX). Just simply look at iPads for value created from better user experience. Ultimately the value of any application depends on user adoption. Change always requires a catalyst and we think it is the better user experience. Clearly, a fairly large upgrade cycle driven by next generation analytics is upon companies for the next two to three years. Unlike the past we think IT groups are feeling the urgency to accelerate the upgrades in this cycle. The pure play BI/Analytics/EIM service providers with the right skillsets are going to thrive in this demand environment. SAP claims that BusinessObjects 4.0 can help analyze huge quantities of data better via better integration between BusinessObjects and NetWeaver Application Server. 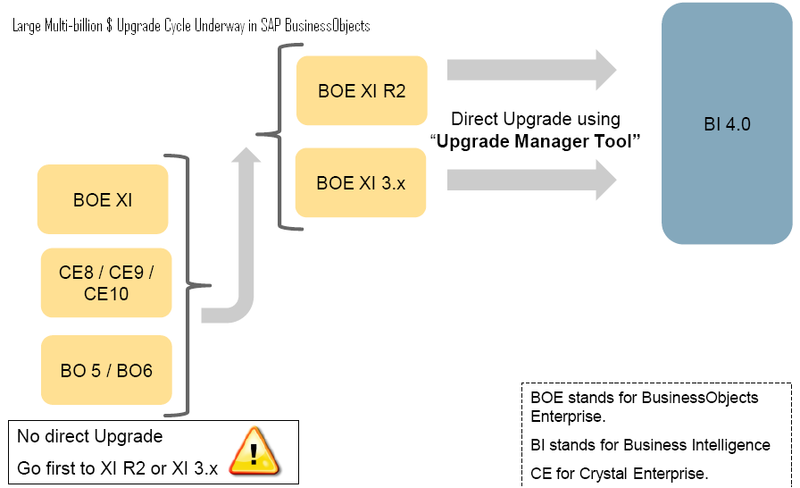 BusinessObjects 4.0 releases has new versions of Crystal solutions such as Crystal Reports software, other BI software such as BusinessObjects Explorer, BusinessObjects Dashboards, and BusinessObjects Web Intelligence. They will also provide integration with enterprise performance management (EPM 10) and governance, risk, and compliance (GRC) solutions. 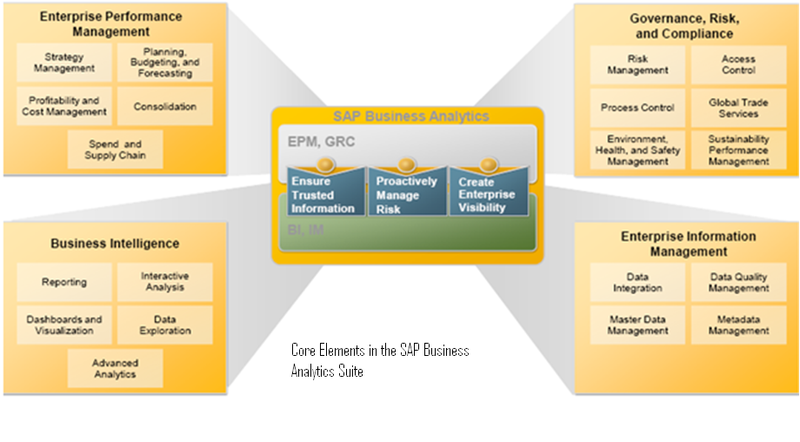 EPM 10 is the business process interface layer where actual insights are derived from. EPM is typically the layer that business users deal with. EPM 10 comes with starter kits for various industries like Banking, and also initiatives (such as IFRS, liquidity and capital expenditures planning). SAP BusinessObjects Intercompany and SAP BusinessObjects Financial Consolidation(formerly of Cartesis). EPM 10 includes SAP BusinessObjects Financial Information Management (FIM), which bridges information from SAP and non-SAP sources and EPM applications. Other nonfinancial, operational applications in EPM 10 include SAP BusinessObjects Spend Performance Management (formerly Spend Analytics) and SAP BusinessObjects Supply Chain Performance Management. 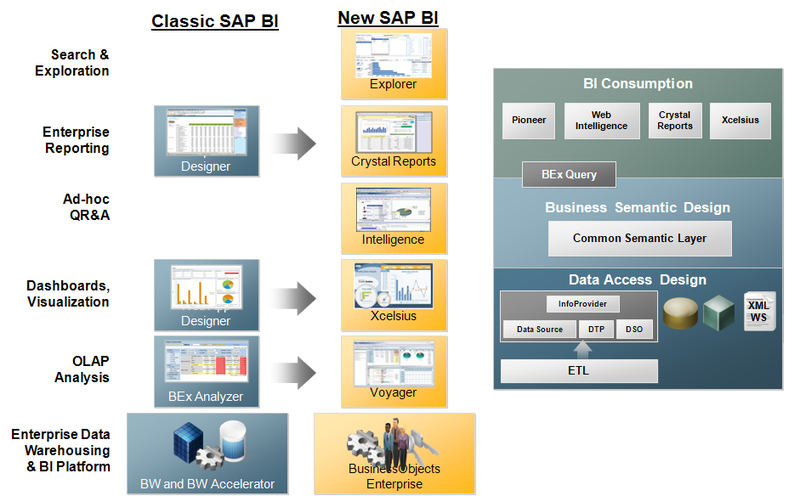 The value of BusinessObjects 4.0 and EPM 10 is moving large enterprises closer to true enterprise BI enablement. Historically, companies executed BI on a project-by-project basis (or business unit by business unit), separate from each other and from their core enterprise data hub (or integration) initiatives, lacking the ability to bring that data together. This fragmentation creates incredible problems in a fast moving data environment where the entire information chain from “raw data -> aggregated data -> information -> insights -> decisions” needs to be tightly integrated in order to generate business value. Stale data leads to sub-par insights.